He's normally a very well behaved lap dragon. However, he does not play well with cats. Also, it helps if your furniture has been treated with flame retardant. Other than that, the perfect pet. Yet another lap dragon. I just have a soft spot for these little guys. 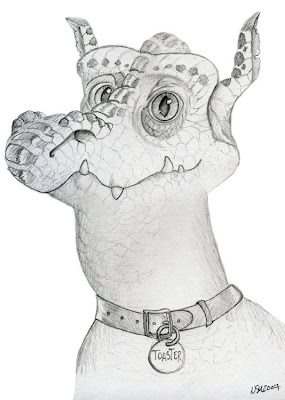 If this one looks vaguely familiar is may be because I was using one of Paul Kidby's swamp dragons as a reference.